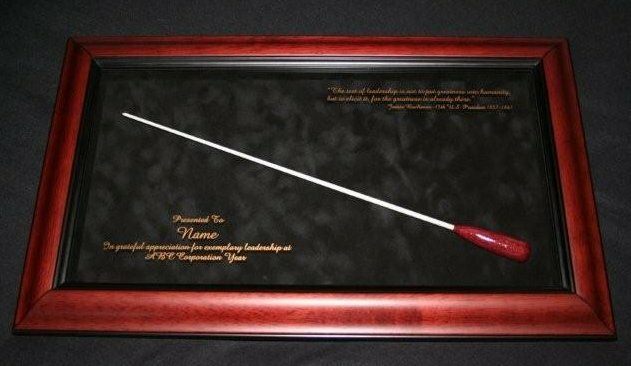 Framed Baton Award - This is a wonderful award to present. Price includes frame, baton, and engraving. Please enter exact engraving that you wish in text box provided when you add to cart. Your text will show up on the bottom left corner. On the top right corner, we normally have, "The test of leadership is not to put greatness into humanity, but to elicit it, for the greatness is already there," James Buchanan 15th US President 1857 - 1861 (baton length is 14"). Please scroll down for more information. If you do not want that inscription, please let us know in the "ordering instructions" box. We can also inscribe another quote of your liking. Please note: This item normally takes approximately 1 week from the order date before it can ship.